Life is all about making choices and taking risks; just like in business, and in poker. Pittsburgh Penguins general manager and 2013 NHL GM of the year winner Ray Shero has just put all of his cards on the table and has gone "All in" with three different guys. With the Penguins coming off of their fourth straight postseason ending in disappointing fashion, the entire internet was expecting huge shakeups by Pen's management. Instead, Shero has decided to maintain the foundation of the Penguin's core. That foundation being Sidney Crosby, Evgeni Malkin, and head coach Dan Bylsma. Deciding to take care of Crosby was a no-brainer during last offseason, despite some people being a little nervous about the length of Crosby's contract (12 years, $102 million) because of Crosby's history of injuries. 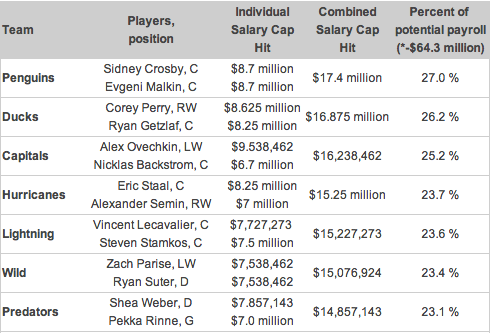 But signing Crosby was a slam dunk and a no-brainer, especially at a cap hit of just $8.7 million per-year. There is little doubt that Crosby is the best overall player in the National Hockey League, and Shero and the Pens have secured him throughout him throughout the prime of his career. With Crosby already locked up, Shero then had to turn his attention to the other half of the two-headed monster; Evgeni Malkin. Like Crosby, re-signing Malkin wasn't really much of a decision and Shero and the Penguins got the contract done a lot faster than I expected. 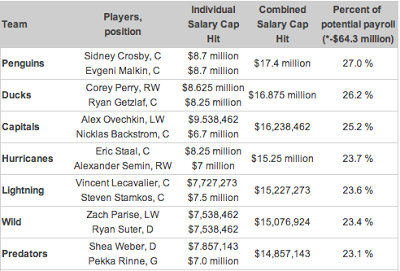 Malkin signed a eight-year deal wit a cap-hit that includes a cap hit of $9.5 million per year. 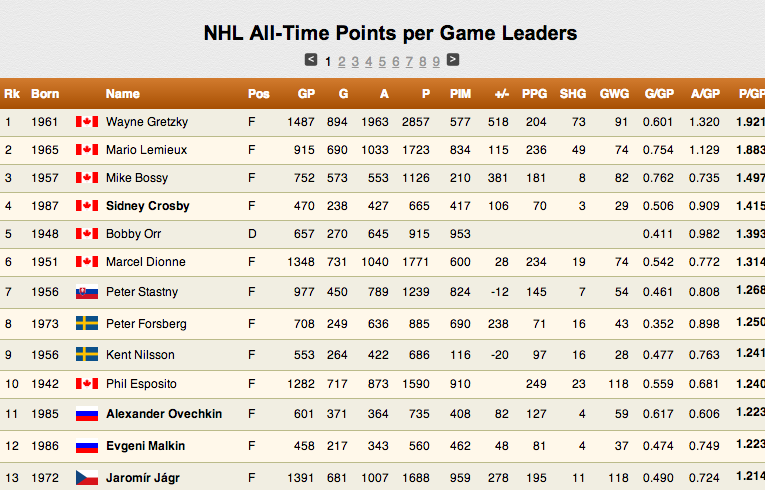 Malkin is arguably the second best forward in the NHL behind his teammate and captain, Crosby. In the day and age of the salary cap, the Pens have made it known that they are going to live and die with the two-headed monster system. But honestly, would you really take any other two players in the league to build a team around other than Crosby and Malkin? I know I wouldn't. Maybe Stan Fischler would though. To me, I wouldn't have been mad one bit had the Pens decided to move in a different direction as far as head coach goes. I'm not really the world's biggest Bylmsa supporter, but I also don't think he's the worse coach in the league either. I just think he is what he is, and that's a head coach given a Stanley Cup caliber roster while learning on the job. You have to remember that this is still Bylsma's first NHL head coaching job and he's only going into his fourth full season. Bylsma's record and success really speak for itself. He's the fastest coach in NHL history to reach 200 career wins; and he's already won a Stanley Cup. In fact, since being the coach of the Pens; Bylsma has the best winning percentage in the entire NHL among active coaches. Most people that I interact with on social media are more "Pro-Bylsma" than "Anti-Bylsma". That's fine and I understand it, but too often I think that Bylsma doesn't take enough criticism. Using "selective stats" Byslma is just 3-4 in playoff series and 20-21 in the playoffs since winning the Stanley Cup. That includes last year's humiliating first-round loss to the Philadelphia Flyers; and a possibly even more humiliating sweep in this year's Eastern Conference Finals via the Boston Bruins. A series that the Pens not only got swept in, but outscored by a total of 12-2. With the huge expectations for the Penguins and the amount of talent that Shero has compiled over the year's, plus the amount of playoff consecutive playoff failures, I figured that Byslam would either be fired or at least on the hot-seat. Instead, Shero gave Bylsma a contract extension through the 2015-2016 season. Bylsma still has a lot of improvements when it comes to his in-game coaching abilities. His lack of either believing in or understanding how to take advantage of match-ups makes others and myself frustrated beyond belief. Playing Simon Despres only three games. Why? Despres was beyond ready to be a top-six defenseman this year. Yet, Bylsma chose to play guys like Deryk Engelland, Mark Eaton, and Matt Niskanen over him night after night. During the regular season, Kris Letang played his best paired with Despres. Playing Jarome Iginla on the wrong wing. When Shero acquired Iginla via trade, it was honestly one of the most exciting trades in Penguin's history. But for some reason Bylsma kept Ignila on the opposite wing that he had been playing his entire career, which made Iginla look awkward on the ice. On top of that Byslma refused to use Iginla on the first power-play for whatever reason. A few more: Relying on the stretch pass too much, not having his team crash the net enough, not sticking with Tyler Kennedy even after Kennedy had proven his worth in the playoffs. Trusting Engelland too much, among others. Shero even said during his press conference that Bylsma is still growing and will continue to grow as a coach. I have no doubt that he will. I for one would have liked to see a shakeup in the coaching staff even if it were just one of the assistants (Todd Reirdon) being relived. To me Shero has shown that he and the Pen's upper-management is content with what they have. 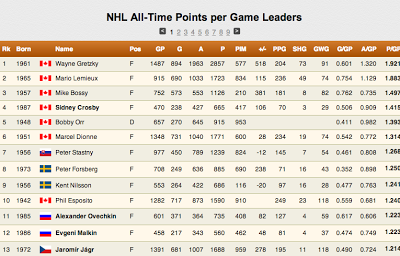 With that said I don't want to think like I"m just giving Shero a pass. Shero has made his share of mistakes and so has his scouting team. Brenden Morrow and Iginla often looked slow and were used out of place. That's on the head coach. The Penguins are supposed to be Stanley Cup contenders based on their roster and previous success. That is the expectations for this franchise on a year-to-year basis; fair or not. Instead the Pens are under .500 in the playoffs since winning the Cup in 2009; which is just unacceptable. Having locked up Malkin and Crosby long-term; Shero and Pens' ownership has shown that they not only believe that they will won another championship with that model; they have also shown that they are not as panicked by their lack of playoff success in the last four seasons. Which is "ballsy" considering that Malkina and Crosby combined for ZERO points in the four-game sweep elimination by the Boston Bruins. Like it or not, this team will live and die with Crosby and Malkin's play. That was shown this postseason. So if and when Crosby and Malkin underperform and the Pens falter; the two-headed monster system will be criticized accordingly. With Shero extending Bylsma I see two things; one being that he realizes that his two superstars like playing under Bylsma, and the other being that Shero didn't want to go into next season with Bylsma's future up in the air. I don't think Bylsma's extension means he's off the hot-seat at all, considering that hockey coaches have a very high turnover rate; and that the Pens extended Michelle Therrien in 2007 and fired him the very next season. I believe that Bylsma is on the hot-seat, but I also believe that the Pens are content with having great regular season success and contending for a Stanley Cup. However, in my mind Shero has finally put himself in a situation where he would can face real criticism. Shero's backing and belief in Bylsma has put himself in a vulnerable position in my eyes; especially if the Pens have yet another playoff collapse next year. The future comes down to Bylsma's ability to grow as a coach; and Crosby and Malkin once again proving that they are indeed the two best players in the league when it counts the most. That is what Shero obviously believes in and for that very reason I believe in. In Shero I trust, and you should too.